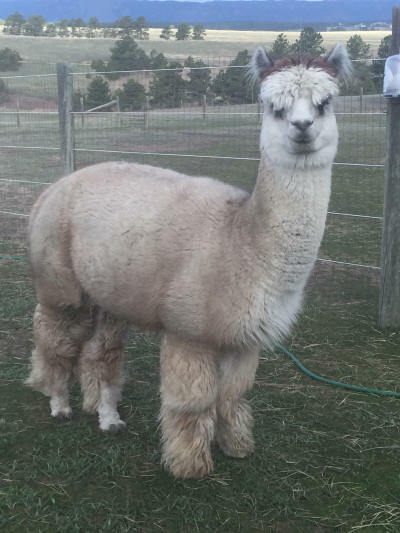 Alpacas and Alpacas For Sale at Xanadu Farm Alpacas - Alpacas For Sale! 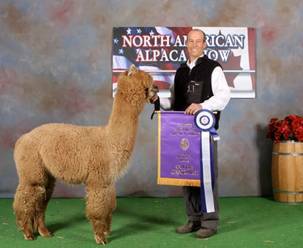 Elite, Full Peruvian Alpacas from our Signature White Champion Pedigrees and our New Fawn Line. 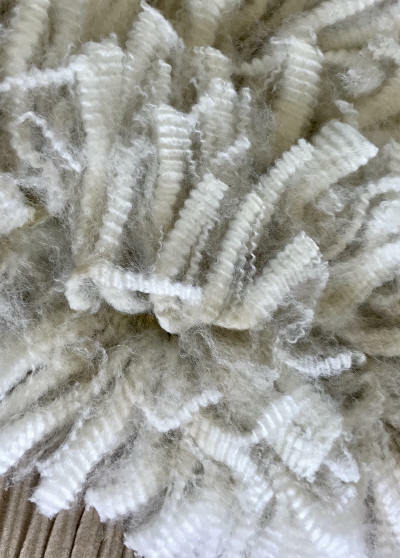 Breeding Successfully for Sustained Fine Fleece. 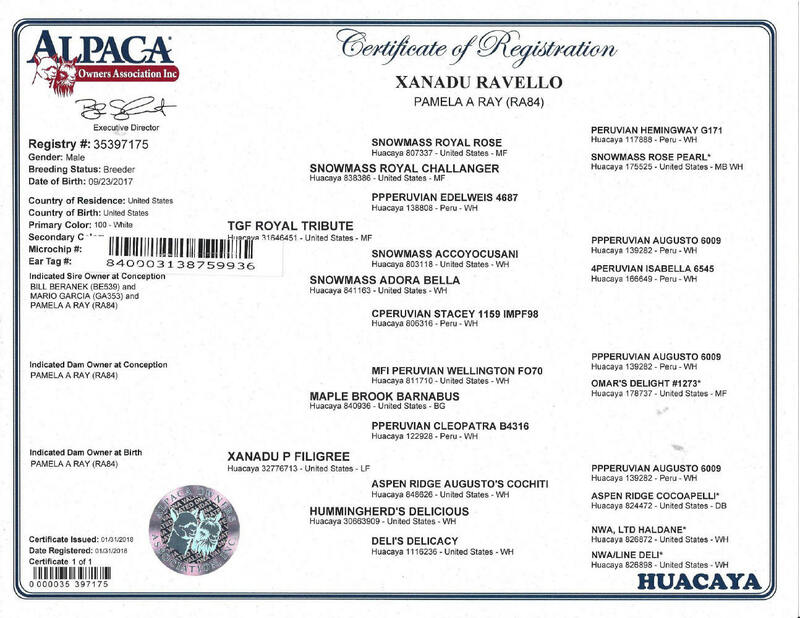 "The Champions Standing on our Herdsire Row"
one female breeding when ready to Aristide son, Xanadu Chevalier. Scroll Down for Package Details! 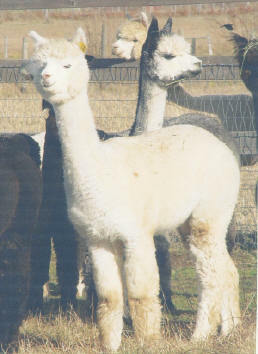 AND OUR HERDSIRE PAGE FOR INFORMATION ABOUT CRIA SIRES & INCLUDED BREEDINGS. 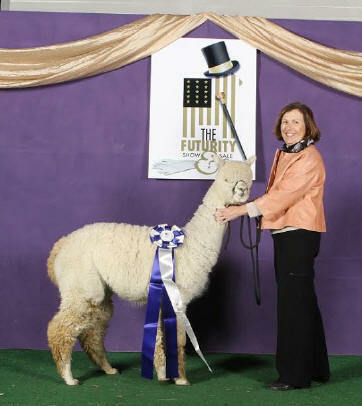 Xanadu Farm Alpacas are sold with our reproductive guarantees for maidens and unproven males. 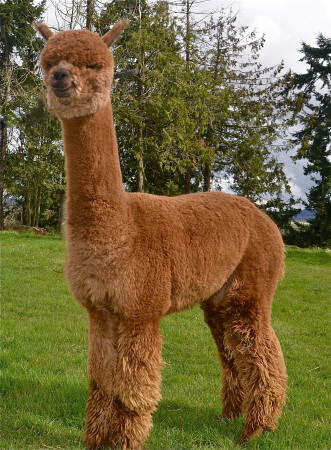 The price of each bred female includes her unborn cria up until 45 days prior to her scheduled delivery date. 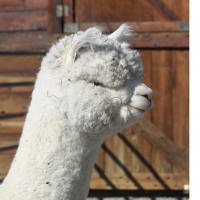 We also offer a free companion alpaca with purchase, when available. 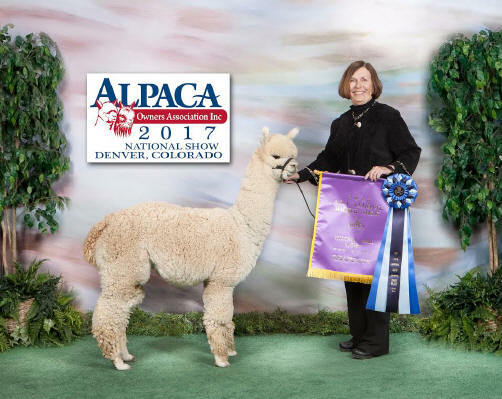 In addition, we have photos and fiber data available for most of the parents and the breeding sires of the alpacas we offer for sale. 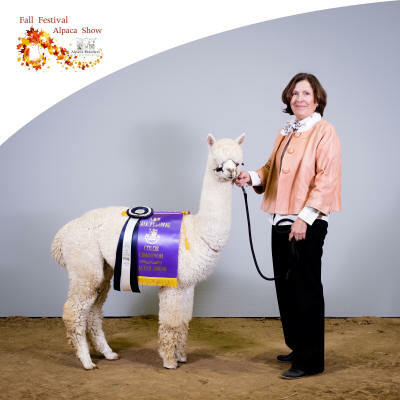 All our alpacas are registered with The Alpaca Registry and BVD tested. 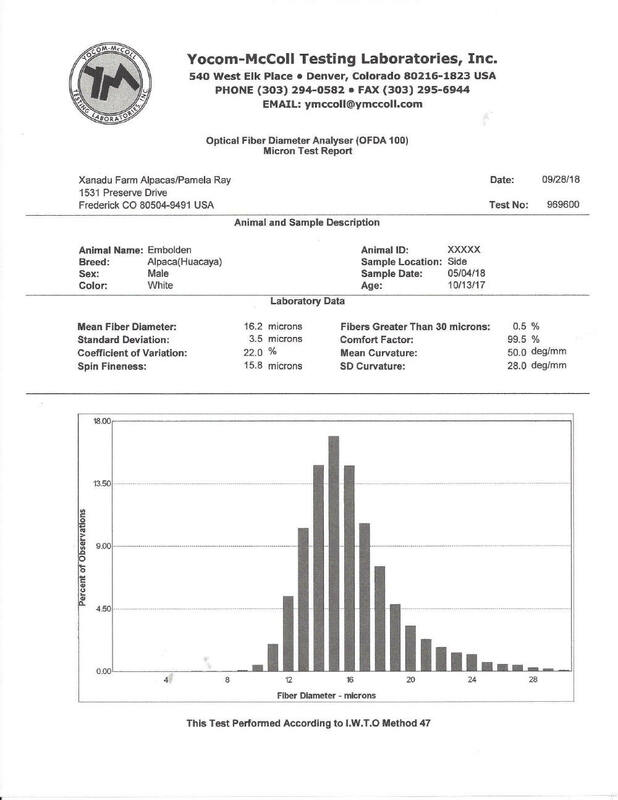 A rare chance to aquire these genetics in a proven herdsire. are offering full ownership in this exceptional male. 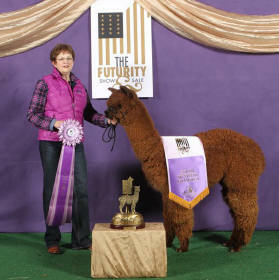 including the AAA Futurity and the AOBA Fleece show. 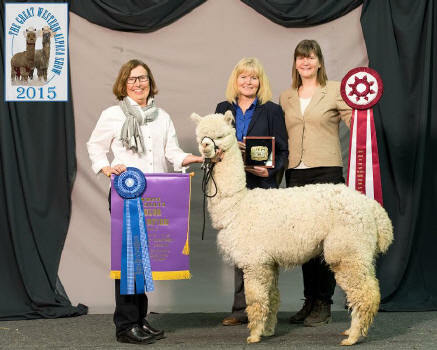 His first 3 daughters were multiple Color Champions. 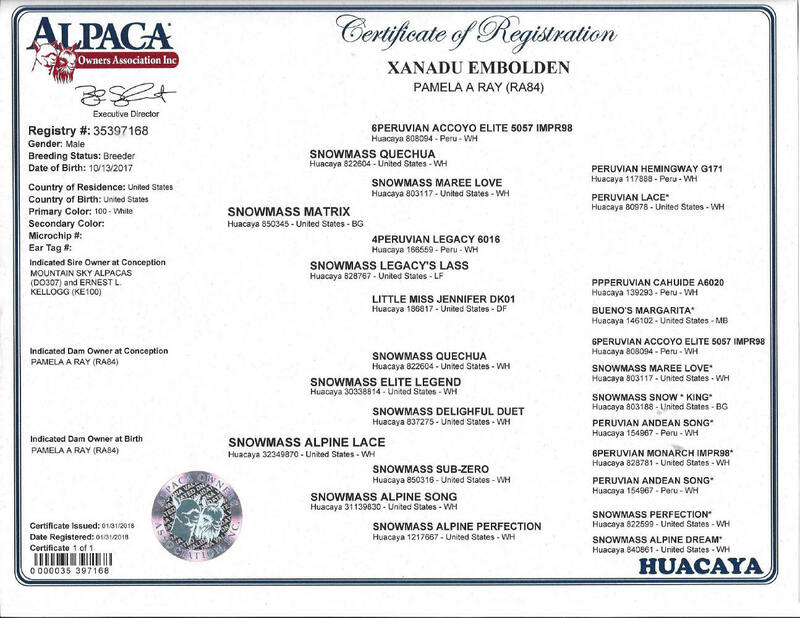 Daughter Xanadu Etude was a 2 X Judge’s Choice winner. Tribute is only available because we’re re-emphasizing our white Peruvian program. Xanadu Chevalier - We’re keeping a ½ interest & offering a ½ interest for sale. 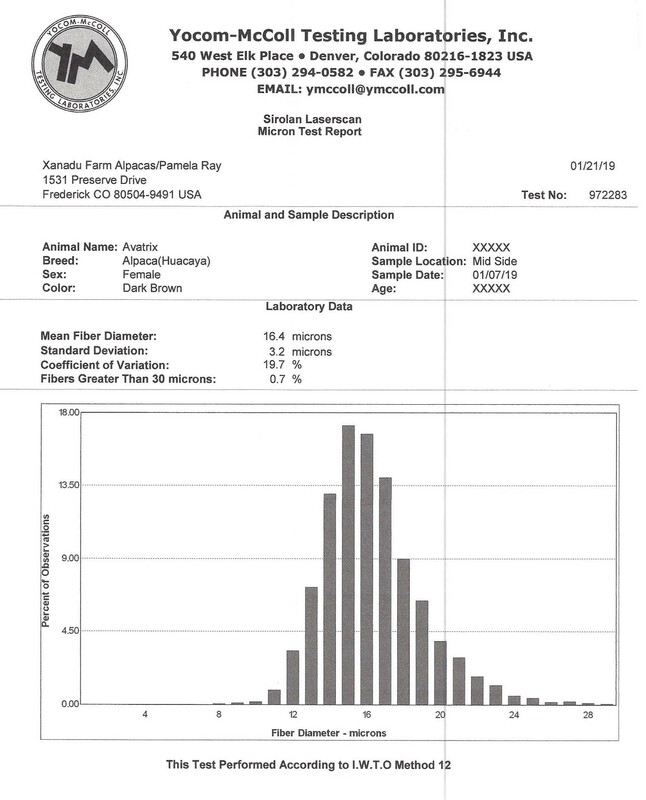 Histogram: 17.9 mic, 3.6 SD, 0.6%+ 30 99.4 CF & 136.2 mm (5.3 inches) fleece length. Price: $8,500 for one half interest with generous possession time. 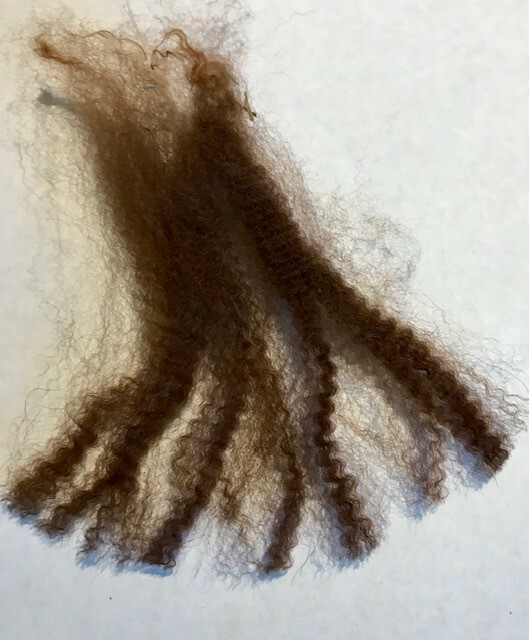 Comments: 2018 EPD FLEECE LENGTH 5.3. 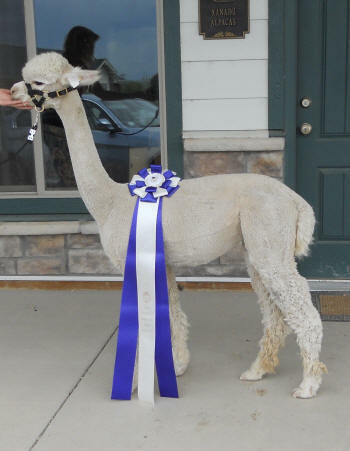 We’ve been breeding for increased fleece length for the past 5 years and Chevalier’s the guy! 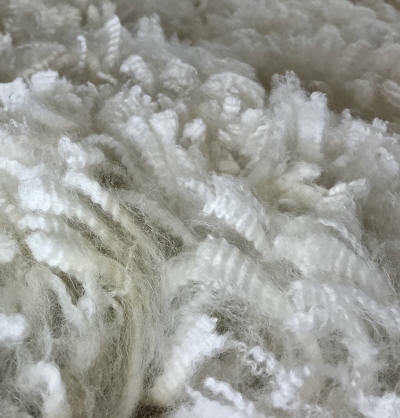 Stunning fleece and just exceptional uniformity and brightness. 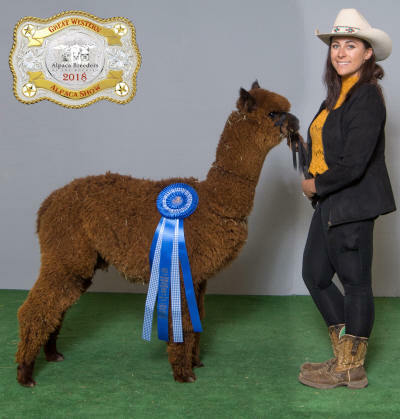 Mom’s a fawn champion, TWF Embosser daughter & of course, Aristide is a 15 X banner winner. 1st & Color Champion, ABR Fall Fest. 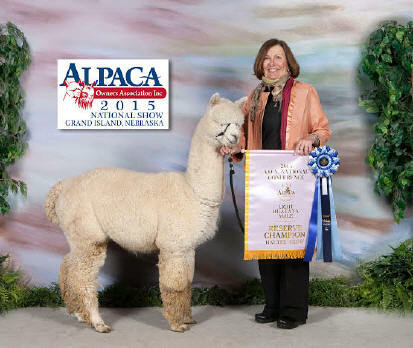 1st and Reserve Champion GWAS, MoPaca, A-OK Shows “& RC Walking Fleece ’19 AOA National show. We’re offering 5 introductory breedings to him. Price: $5,000 Make us an offer! Comments: Broadway has also joined our Herdsire Row. Great introductory price for his breedings. 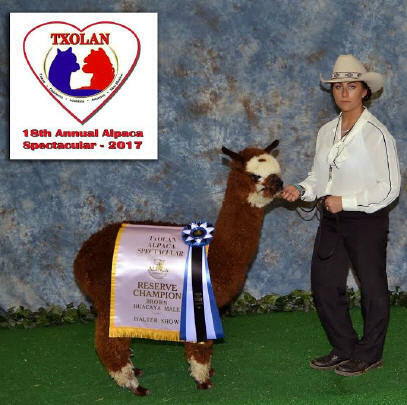 1st Place 2017 AOA fleece show, 1st and Reserve Champion his 1st time in the ring at the ’17, Level III, TxOlan Show & ABR Fall Fest Fleece, 1st Place halter GWAS, A-OK & MoPaca. 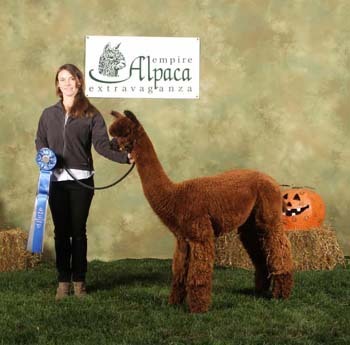 His chocolate brown fleece is divine - luminous, fine & uniform with no white fibers. 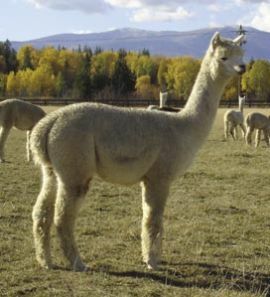 He’s from a fading fawn mom and a sire with grey in his pedigree. We think he’ll throw grey. He’s working now! Comments: Exceptional fleece uniformity, fineness & architecture with a gold-plated pedigree. 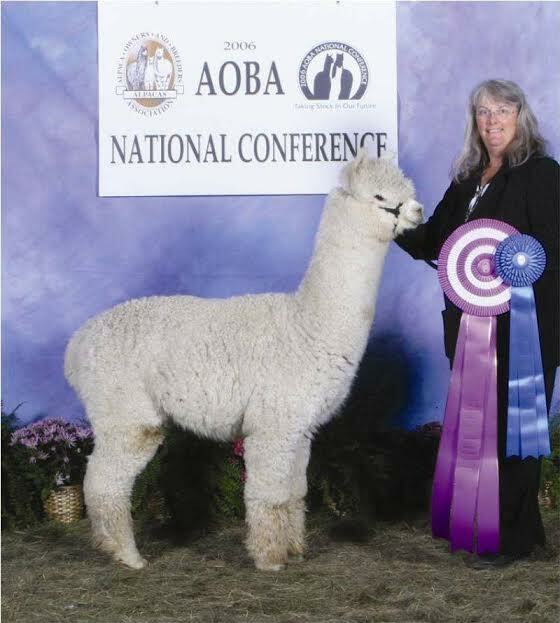 1st Place Walking Fleece, ’18 A-OK Show, 2nd in a class of 11 @ GWAS at 6 months old. Buy him while he’s young at a great price. Comments: Just look at this pedigree & his fine, uniform fleece. He’s a Matrix son & his dam is a Judge’s Choice Elite Legend daughter. We’ve brought our other Matrix son, Xanadu Alchemist, onto our Herdsire Row. That allows us to offer Embolden for sale. 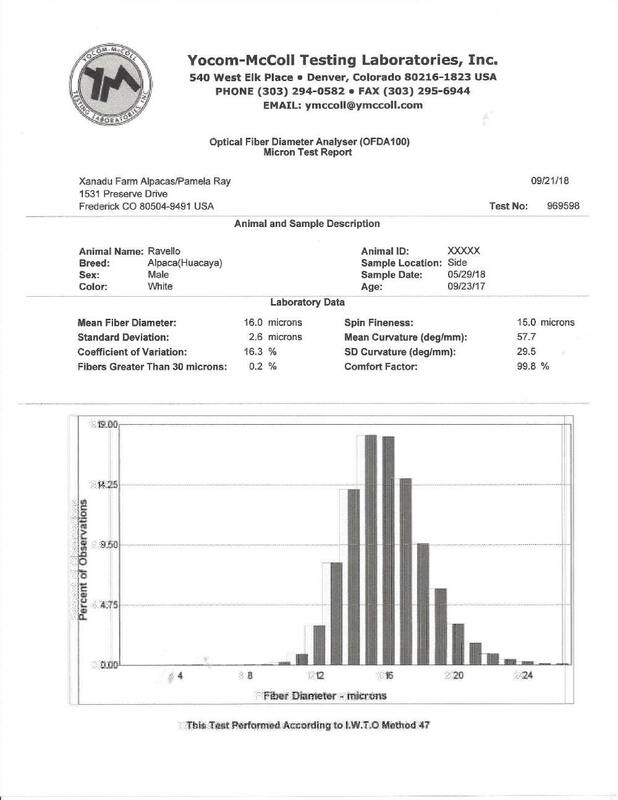 Don’t miss the opportunity to bring these stellar genetics into your breeding program at a great price. Comments: We have only 3 Aristide sons because he gave us mostly females his last year in the US. This youngster is from an excellent Snowmass Messiah daughter and promises to be a very good one. Comments: Extraordinarily well-organized fleece architecture. 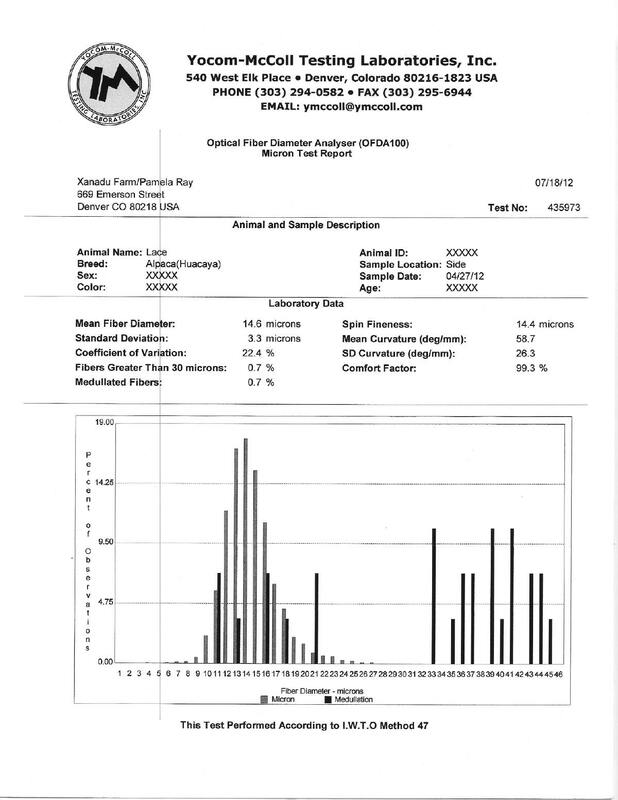 Add to that brightness, uniformity & excellent fineness and you have your next herdsire. 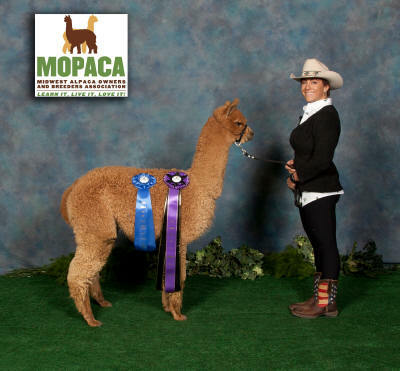 1st Place large class at ’18 GWAS show, 1st & RC Halter A-OK Blastoff &1st & CC halter ’19 MoPaca show. 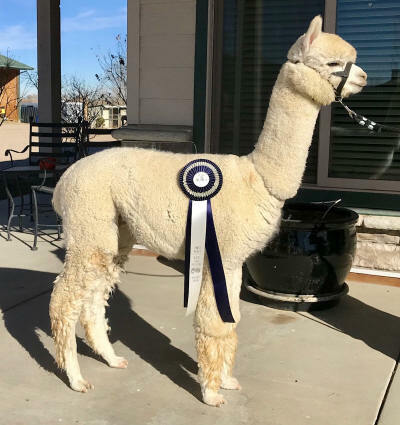 Comments: Wow, we never thought we’d offer this Judge’s Choice female for sale, but we’re re-aligning our foundation female herd to accommodate our new machos AND we’re keeping both of Lace’s daughters, Aristide girl, Xanadu Twice as Haute, and Barnabus girl, Xanadu Irish Lace. 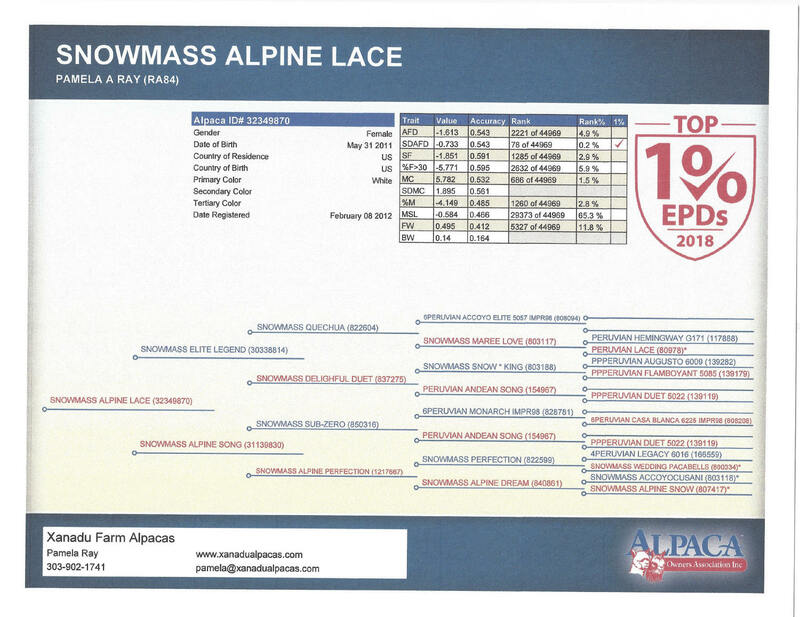 Elite EPDs for fineness, mean curvature, uniformity & fleece weight. A proven genetic treasure. 1st Place 2012 AAA Futurity Juvenile White Halter. 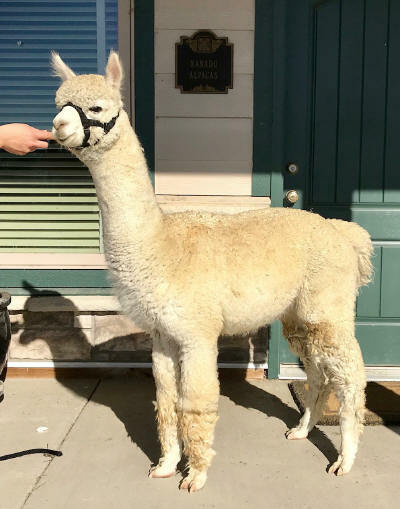 Breeding Status: Bred to the incomparable Snowmass Loro Piana. Cria due 10/06/19. Comments: Haven’s an Accoyo Augusto granddaughter and a Presidio great-grand daughter. A blend of 2 very successful lines. 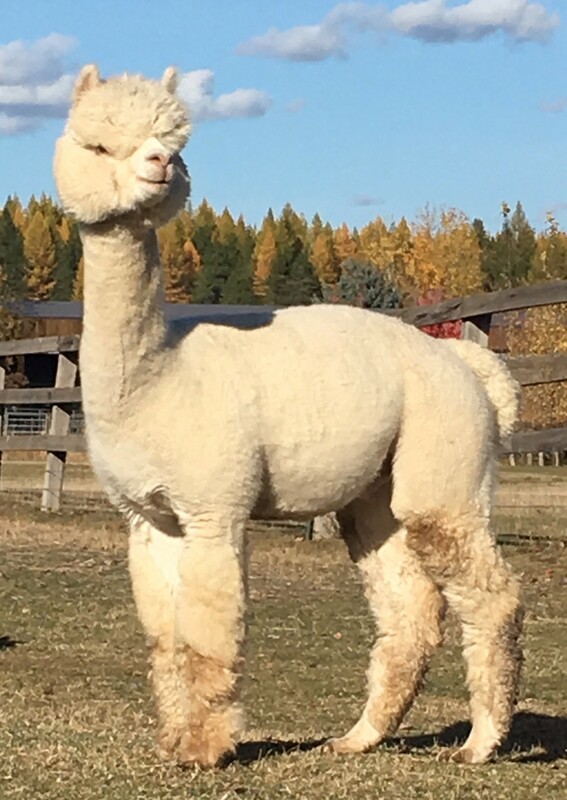 We’re keeping her 2018 Aristide daughter, Twice as Haute, in our foundation female herd. 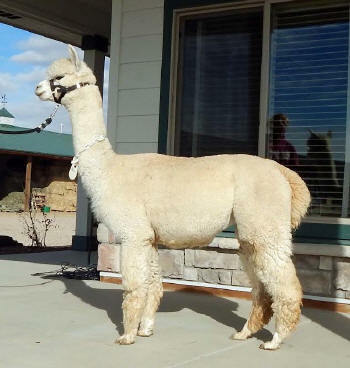 Breeding Status: Bred to the incomparable Snowmass Loro Piana. 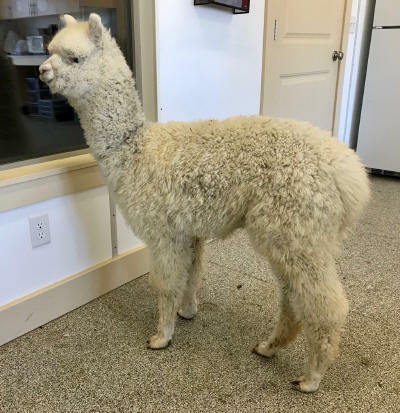 Cria due 5/14/19. 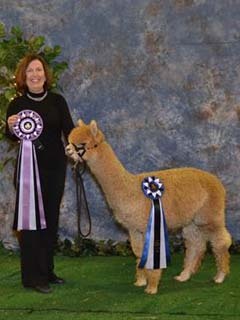 Comments: This delightful blue ribbon female has had 3 stunning crias for us including a true black girl with Aristide. 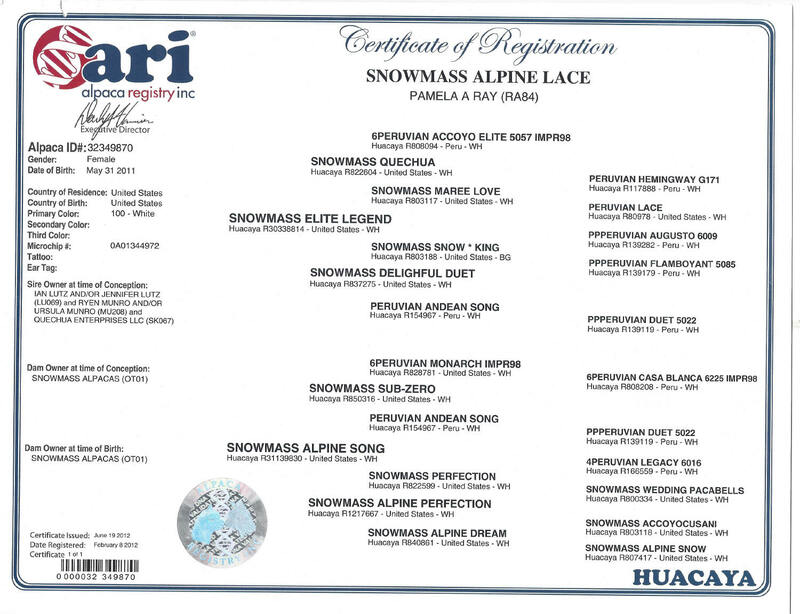 [See our Mom’s page] AND she‘s bred for spring to the Snowmass Best Man son, the incomparable Loro Piana. 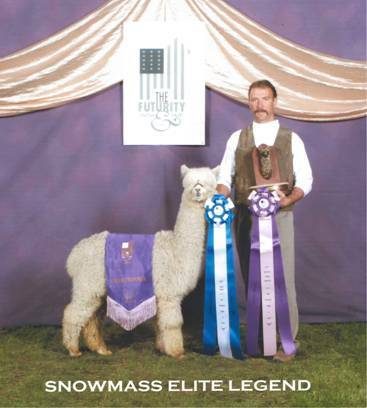 Breeding Status: Bred to Snowmass Loro Piana. 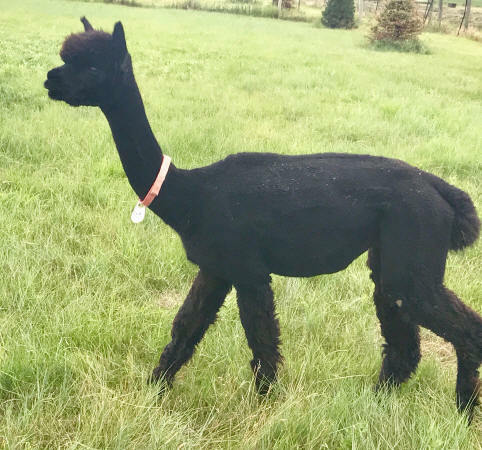 Cria due 4/22/19. 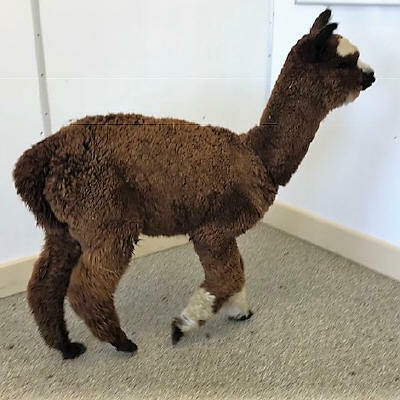 Comments: This pretty little girl boasts an Accoyo-rich pedigree with Legacy, Royal Fawn, Felix & Leon featured. She brings a fleece that’s very dense, with a long staple. Breeding Status: Bred to 10 X Get of Sire Winner Maple Brook Barnabus. 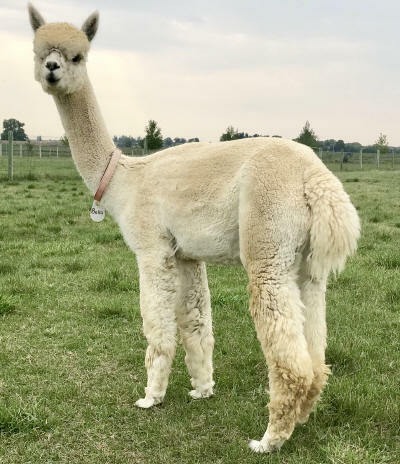 Cria due 4/10/19. Comments: Primrose’s fleece is coming back grey on her neck! Beautiful fleece on this little girl. It’s bright, soft and carries a long staple. 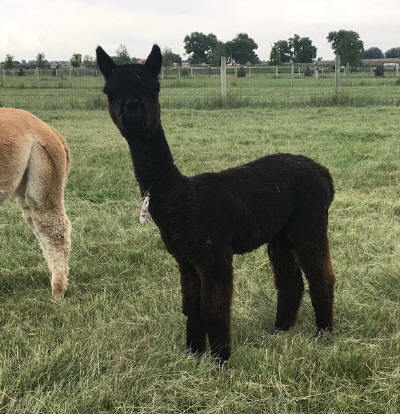 Her dam Leia is from 2 TB parents and 3 of 4 TB grandparents so we’re pretty sure Primrose will throw black bred to black. 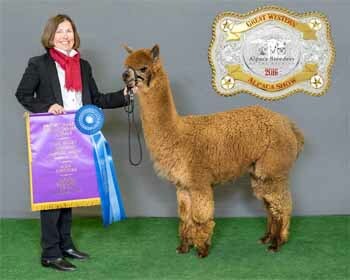 Celio’s a champion Lennox son from a LRG dam. 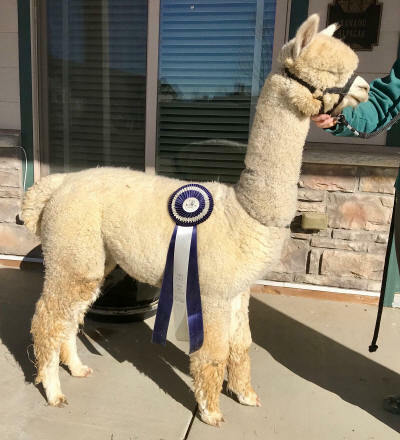 1st Place Walking Fleece – 2018 GWAS. 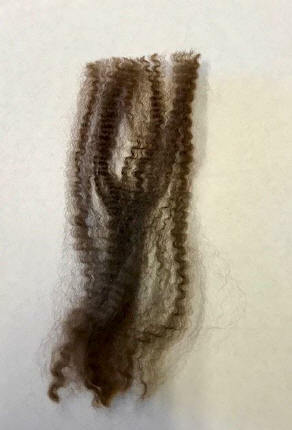 for purchasing this lovely young female. Comments: Strong grey and black genetics. She is greying up in her second fleece. 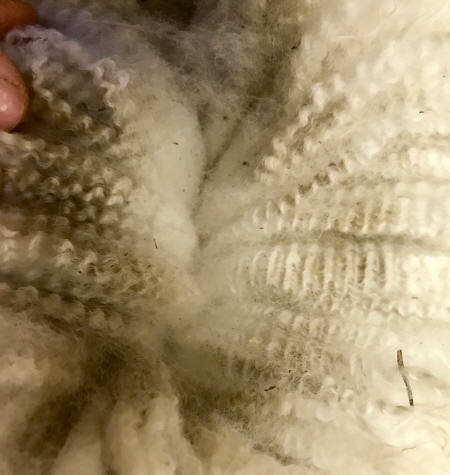 Ava’s fleece is fine & uniform with an evolved architecture. Dad is a multiple CC Neversummers 38 Special son & mom’s a blue ribbon Beethoven’s Dorian daughter with a grey spot on her side. Bred to Xanadu P Aristide, Espresso threw our true black girl, Xanadu Night Moves. 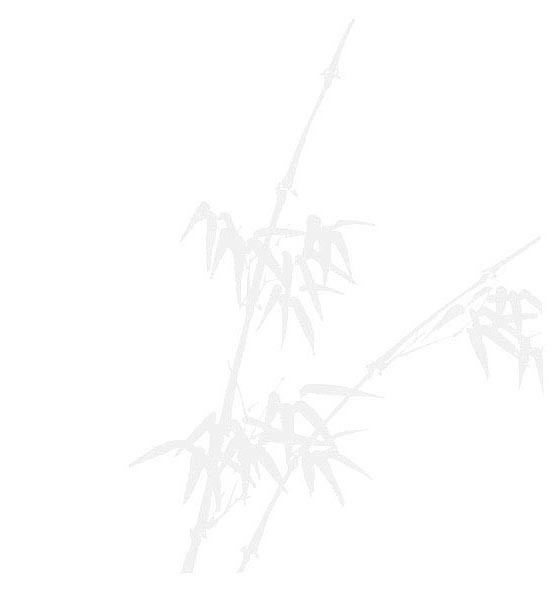 Add Avatrix to your grey program. Breeding Status: Ava’s price includes a breeding to any non-restricted Xanadu herdsire which may be used on any of the buyer’s females. We’re pleased to offer for sale these two very handsome fawn boys. Both have excellent fleece that’s fine, uniform in micron & very bright. The pair would be a treasure for a hand spinner or fiber artist. and would also be a good fit for 4-H or to enjoy as pets. We’re selling Freddie for a customer. Royal Fawn, Felix, Leon + Accoyo Legacy. Ava started as a chocolate brown but is coming in grey. Beethoven’s daughter who threw a true black girl with Aristide. 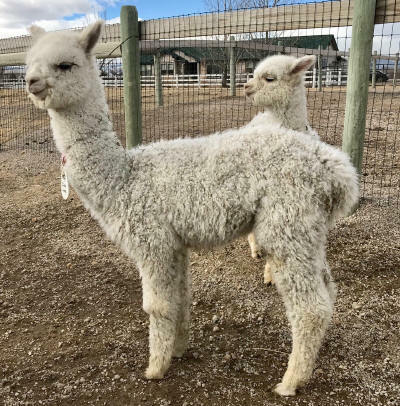 Snowmass Loro Piana crias due this spring! A unique opportunity to add these genetic right now. Haven’s sire is an Accoyo Augusto son so her quality is no surprise. Her dam is a Presidio granddaughter as well – bringing exceptional density. Espresso’s sire is the great Beethoven’s Dorian & her mom is a MFI Donovan daughter. We’re keeping her gorgeous true black daughter from Xanadu Aristide. She does color. for her as long as you own her to any unrestricted Xanadu herdsire. Purchase a breeding male & nominate one of your own females for the program.